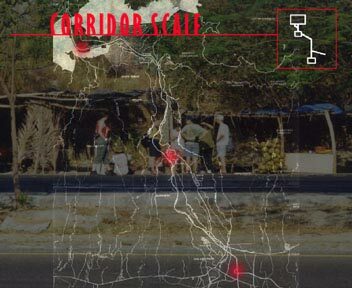 Corredores urbanos is a regional development project in El Salvador. Starting with the question “how does a country insert itself in a global system?” the aim of the study is to point out competitive advantages of El Salvador. Coming from global to metropolitan to neighbourhood level, weaknesses and strengths are defined to characterise how competitive is a state system. They are forming the base to find out main issues and starting points for further developments of the country. Competitive advantages for El Salvador are defined by investing in a sustainable social, technical and economic structure which would concentrate on education, accessibility and mobility.